My house have a lot of bananas. I bought some bananas the other day when I go to the market and at the same time my mother also bought some for me. What to do with the ripe bananas and I don't think we could finish them all in time. I just want to turn them into muffin rather than leave it there, wait till it got rotten and end up in the rubbish bin. I first try to amend the mandarin orange muffin recipe in Fad About Food into banana muffin by replace the mandarin orange with banana. But, it turn out to be too sweet and the muffin's batter spilled out half way I baked them. Very ugly looking muffin I got. I don't know what's wrong with it. Maybe the oven is too hot and the batter are too watery because I just add in the mashed bananas without deduct the amount of milk and butter used in the recipe. I failed on the first try! After I taste and look at the muffins, I decided to go for the second try. This time, I reduced the amount of sugar, milk and butter. I bake the muffins at 160c instead of 180c for 20 mins, my oven tend to get too hot when it's 180c. The top of muffins got burnt easily while inside are not yet cooked. It'll starts to spill out later on. Sieve flour, baking powder and cinnamon ground together. Set aside. In a big bowl. Stir and mix butter, milk, eggs and vanilla together. Add in sugar and salt. Mix till well combined and add in the mashed bananas. Mix well. Fold in the sieve flour at one time and mix slowly till well combined. Remember not to over stir the batter. Scoop the batter into the paper cup, add the sliced banana chunks and cover it with some batter. 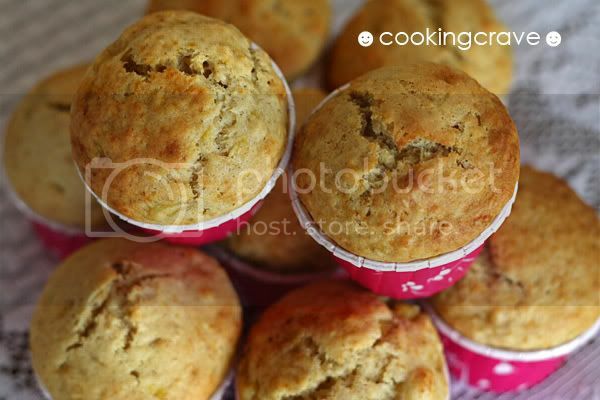 Fill about 8/10 of the batter, leave some space for the muffin to raise when we bake them. Bake at preheated oven at 160c for 20mins or till it's cooked, when the toothpick inserted at the center of the cakes came out clean. 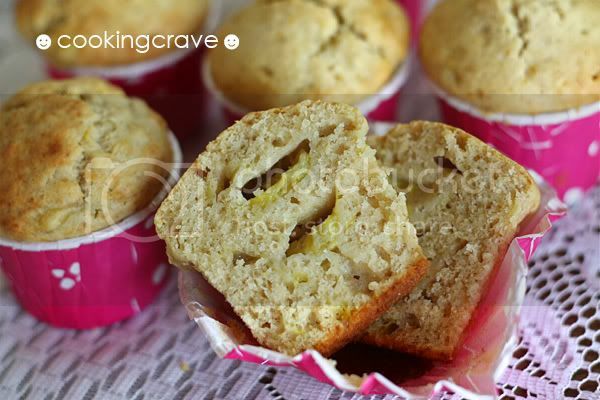 Note: The recipe for this banana muffin are just perfect. You don't have to reduce the sugar or anything in the recipe. Just make sure the banana used are the ripe one. If the banana you used are big then 4 is enough, if the banana are small then you might need 5 bananas. 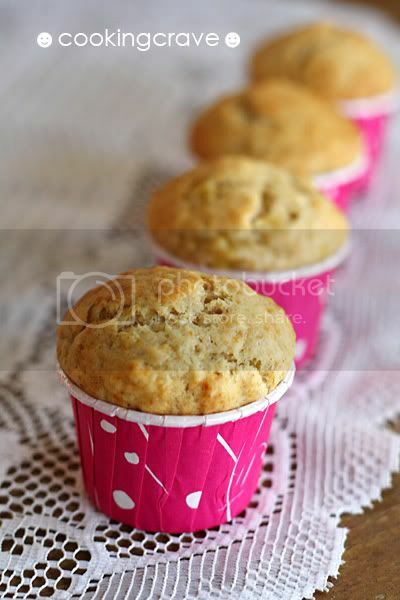 Makes 12-14 muffins - depend to the size of paper cup used. TinTin, what's the difference for using plain flour & self-rising flour for muffin? U used self-rising flour in choc muffin last time, but now plain flour! Pink Lady: Self-rising flour is actually plain flour that's been mix with baking powder. Different recipes requires different flour and actually we can replace the self-rising flour with plain flour and add the baking powder seperately. I understand.My question is, how does the muffin texture differ from using the two diff flour? 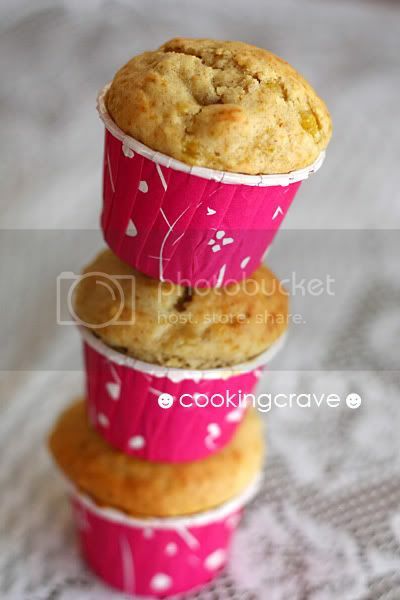 The texture of the milo chocolate chips muffins are more to the typical muffin texture, more chewy types and this banana muffins it's more cake like texture. I like the cake texture muffins compare with the actual muffin texture. I don't have this flour flavour in the Milo Chocolate Chips muffin I baked, it's just that I found it too sweet and after I reduced the sugar and chocolate chips, it's perfect. Oh, i see. Thanks for ur explaination. I think i will like ur banana muffin w cake texture. Hello there,Tintin! !It's been a hile I haven't been here--sorry for that! !How are you?? Wow! !another recipe for me to use in the future! !My kids loves them,too!! 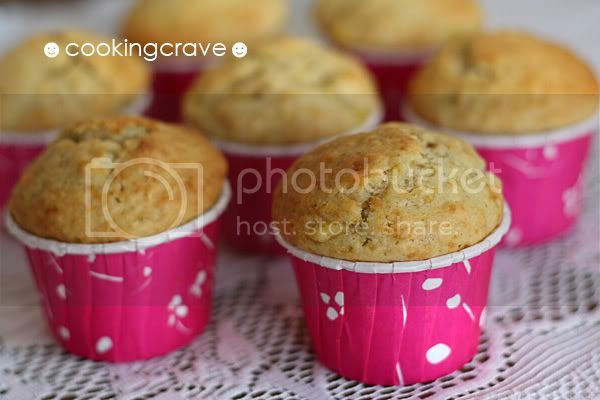 I am a fan of all banana baked goodies :) What pretty cupcake liners! which all the cute lit cupcakes n food, which helps a lot. wow great, you even fine tune recipes to your liking now.. wonderful.. I had tried this recipe. The muffins turned out to be very soft and moist! I even added some desiccated coconuts. Thanks for sharing.